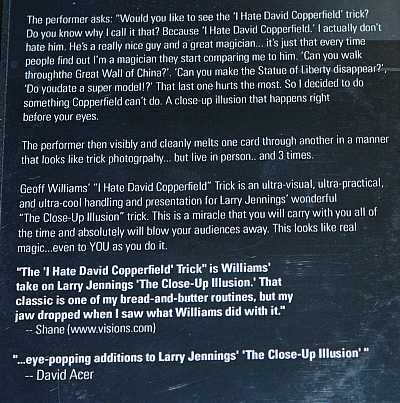 Geoff Williams has taken a classic Larry Jennings effect and added a few really nice handling touches to create this very visual and baffling card routine, which he has given a horrible name (in my my humble opinion). But the dumb name aside, the effect is very magical, and rivals Card Warp for being one of card magic's most visual and clean effects. About the name: he says he hates how every one compares him to David Copperfield, in a negative light because Copperfield does big illusions and he only does card tricks. But then he shows this trick to prove that card tricks can be even better than the Statue of Liberty disappearing. The effect is simple: three cards are shown, two red backed queens and one blue backed Ace. The Ace is placed under the queens in a fan, and visibly penetrates up and between them. This is repeated a few times, each time more slowly and more magically. It is an absolutely perfect illusion of the card melting through the other cards. You will make this from some extra cards you have lying around -- don't worry, it takes about 5 seconds to make. Once it is made, you are all set to learn it, which will not take too long either, because despite the powerful illusion, the method is not difficult. Practice it well, however, as it deserves to be well-guarded and well-performed. Cards cannot be examined, but the handling is so clean and visual that the spectators will be stunned for a moment, at which time you can slip the cards back into your pocket and move on to another miracle. Opened for inspection, but in new, unused condition, with DVD instructions.